Parlux produces the finest quality hairdryers on the market. These Italian-made tools are loved by professional stylists and praised by beauty editors around the world. High-performing Parlux hairdryers are built to withstand intensive use at salons by delivering exceptional airflow, heat, and speed. 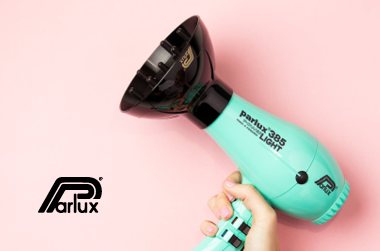 You can get salon-quality hair at home with a Parlux hairdryer. When conceiving Parlux hairdryers, designers wanted to create easy-to-use products with simple geometric shapes and clean lines. The dryers needed to be ergonomically optimised and comfortable to use for both salon professionals and home consumers. But the clean design and ergonomic shape were only the beginning. As technology evolved, ionic and ceramic hair dryers grew quickly in popularity. Hair stylists discovered that these new technologies reduced drying time while allowing hair to retain its natural moisture. The combination of ceramic with a negative ion charge permits heat to radiate directly inside the hair, leaving locks shiny, soft, and healthy-looking. Parlux offers a wide range of professional hairdryers that meet the standards of the most demanding hairdressers. The brand's dryers are made with the highest-quality, most modern materials. Once you have used a Parlux, you will never go back to anything else! Parlux offers a range of hairdryers to suit every need, from the Supercompact 3500 to the state of the art Alyon. With a lifespan of up to 3000 hours and a high powered 2250W motor, the Alyon dries hair faster and with less damage than ever before. An optimised design means temperature is evenly distributed throughout the dryer to prevent overheating at the front, and the innovative Hair Free System makes keeping your Parlux clean quick and easy. Adore Beauty is an official stockist of Parlux. Showing 20 products of 25. What are the differences among Parlux models? Leaves my hair silky smooth, and no breakage! I can’t believe I wasn’t using this earlier. I had a 6 year old hairdryer that was damaging my hair more than anything. Couldn’t blow dry or style. This Parlux has SAVED my hair. It’s left shiny and sleek instead of frizzy and dry. It has shortened my drying and straightening time and made my hair look and feel healthier. I stubbornly refused to have a hairdryer at all until I realised I couldn't keep turning up to work with wet hair. Fears of ruined hair and spending ages trying to get it dry were unfounded once I got my Parlux. If you are more sensible you will get some heat protecting spray - I am not using one and my hair has come through almost unscathed. The Parlux is also reasonably light, not as noisy as I had expected given the power, and gets my hair dry in a minimal length of time. Better by far than any other hairdryer I've tried.